Going to great heights to maintain the health and vitality of your trees! Have a tree issue? A problem limb? Strange symptom? Or maybe you’re just looking to improve the overall health of your trees? We know just how to take care of it! We’ll help ensure optimal growth as your tree matures, or address a specific problem or structural issue. Whether you have a particular problem or you’d just like to see your trees look a little healthier, Arborwood can take care of it. Make sure you get a correct diagnosis. Have an Arborwood arborist come out and assess your trees and recommend the best course of action. 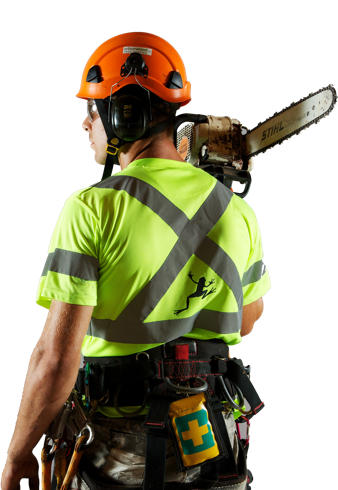 When it’s time for a tree to come down, we get the job done safely and according to industry best practices. The best in tree care and client care. At Arborwood Tree Service, our great reputation is built on professionalism and client satisfaction. Your trees are living resources and our certified arborists have the expertise to help you steward your property with beautiful, healthy trees and shrubs, for now and for the future. Maintaining the vitality of your trees is our mission, doing it with safety, integrity and professionalism is our promise. If you love working with our most beautiful natural resource, check out our job openings! We serve a wide area of Southern Ontario, from Oakville, Burlington, Hamilton, Grimsby, St. Catharines and into the Niagara area. If our schedule permits, we’ll be glad to come out to surrounding areas too.